Sushi is a very popular food these days, and many cities offer a wide variety of sushi restaurants to choose from. Still, this Japanese style cuisine is not as well known to Americans as, say, Mexican or Italian dishes are. Here are some fun and useful things to know about this food when you go to eat in your local Japanese restaurant. 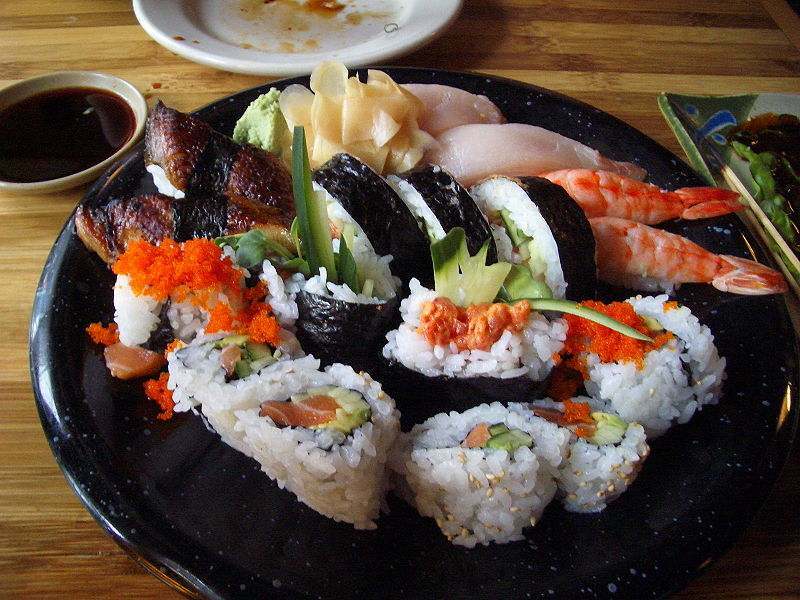 “Sushi” originally meant fermented meat or fish. 2,000 years ago, the Japanese preserved fish by salting it and leaving it to ferment. Later they started to pack the fish with uncooked rice to speed the fermentation process. 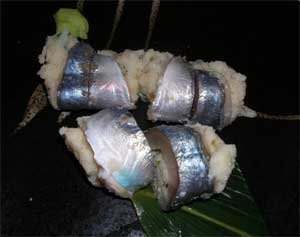 Over time, this raw, fermented style of fish and rice became specialty dishes in their own right. By the 1400s, tangy, fermented rice was a popular side dish. By the 1500s, Japanese cooks were adding vinegar to speed fermentation and artificially create the tangy taste. This also made fermented sushi less pungent. 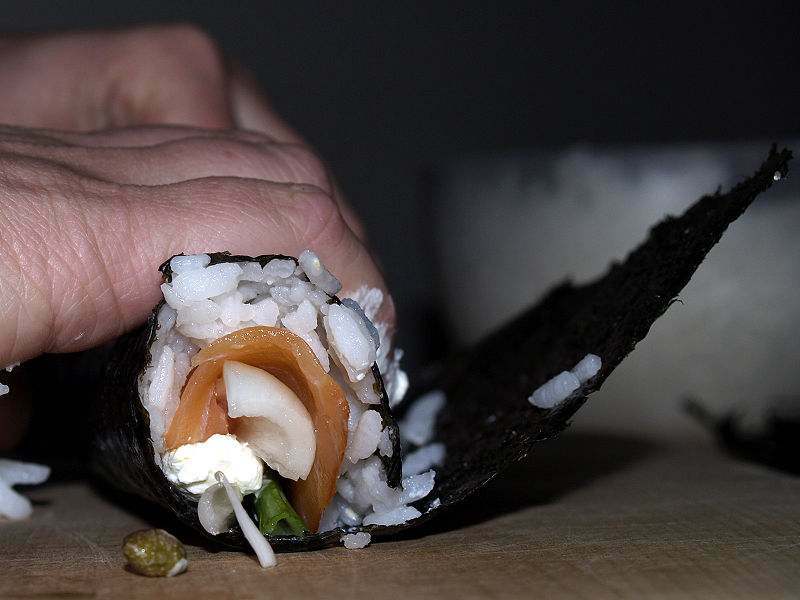 New kinds of sushi began to evolve using only cooked rice and vinegar and less-fermented fish. 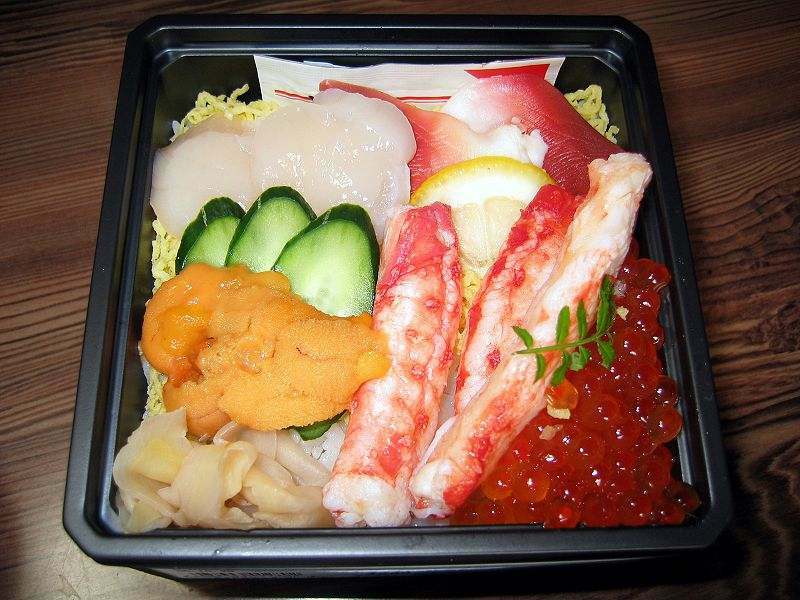 These various styles of sushi (such as Oshi, chirashi, and nuku) are still popular in Japan. By the 1800s, street vendors made “fast food” out of raw fish and sushi rice in what became known as Edo style sushi, named for the capital city. When Japanese businesses began expanding in the U.S. in the late 1970s, more sushi restaurants opened to serve food familiar from home. 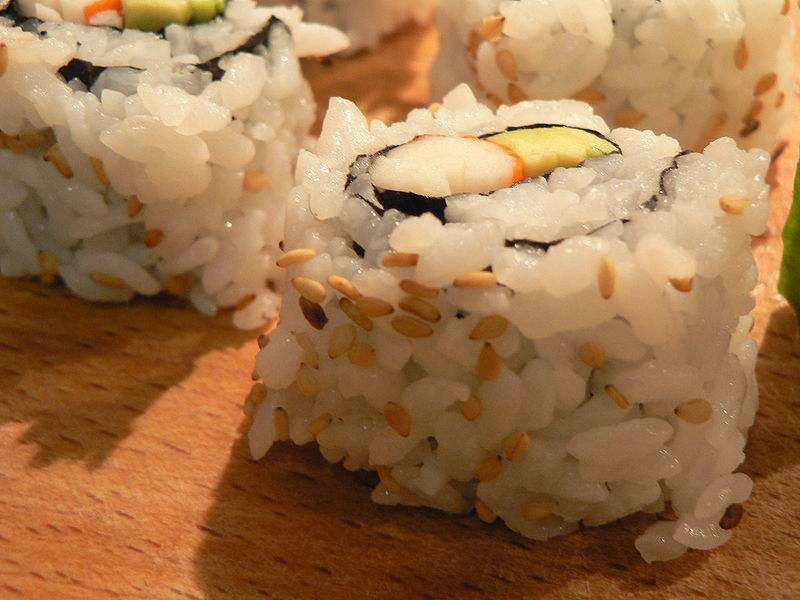 Americans weren’t so thrilled with the idea of eating raw fish until the California roll was invented. This combo of avocado and cooked crab was the perfect introduction to sushi for North Americans. 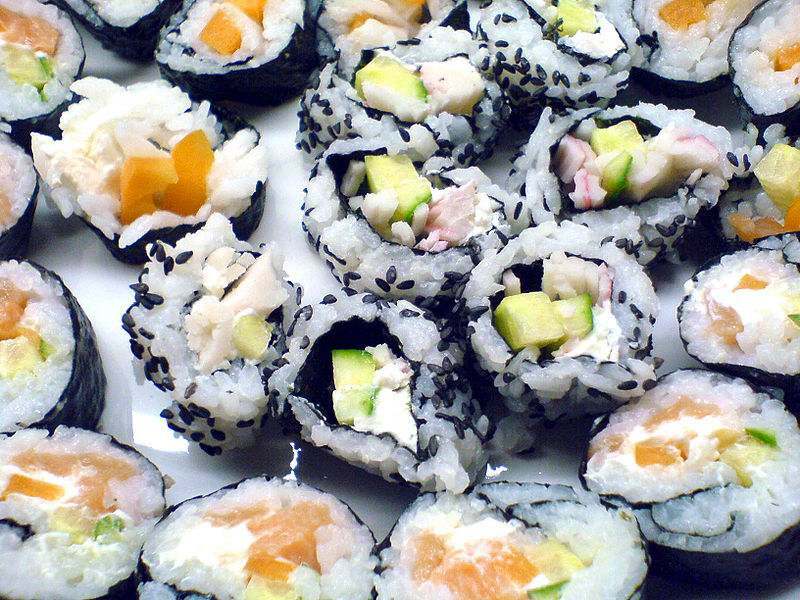 Its success launched an era of experimentation and creation of new types of sushi. Today’s sushi is a fusion cuisine blending Japanese foods with ingredients an American palate enjoys. 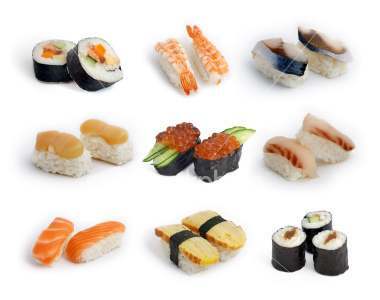 Sushi comes in many varieties but only a few basic styles. Here are the dinner table classics. Nigiri sushi is the original street food from Edo. This oblong of vinegar rice is topped with the main ingredient (not always raw fish). Maki is the name for a sushi roll. A piece of nori (dried seaweed) is covered with sushi rice and other ingredients, rolled shut, and sliced into rounds for serving. 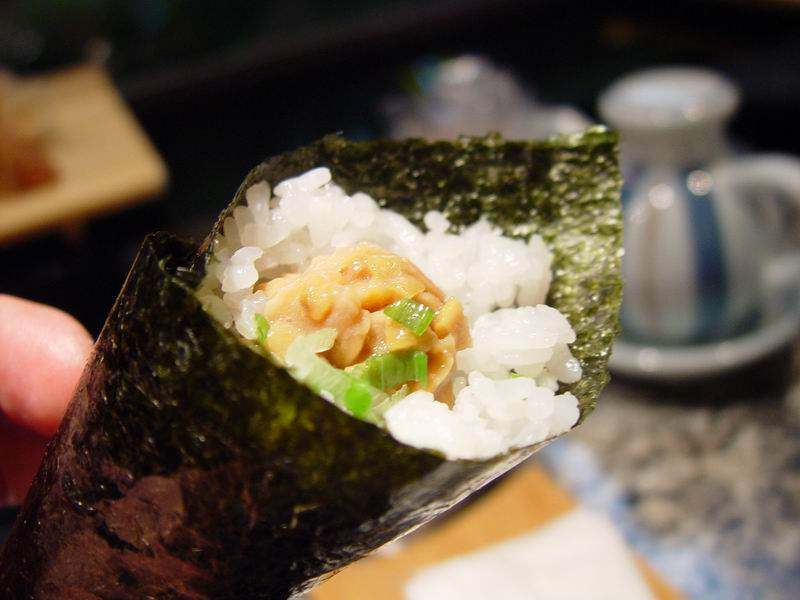 A hand-roll, called temakizushi, is maki rolled up into a loose cone with the ingredients inside. It is held by hand and eaten that way. 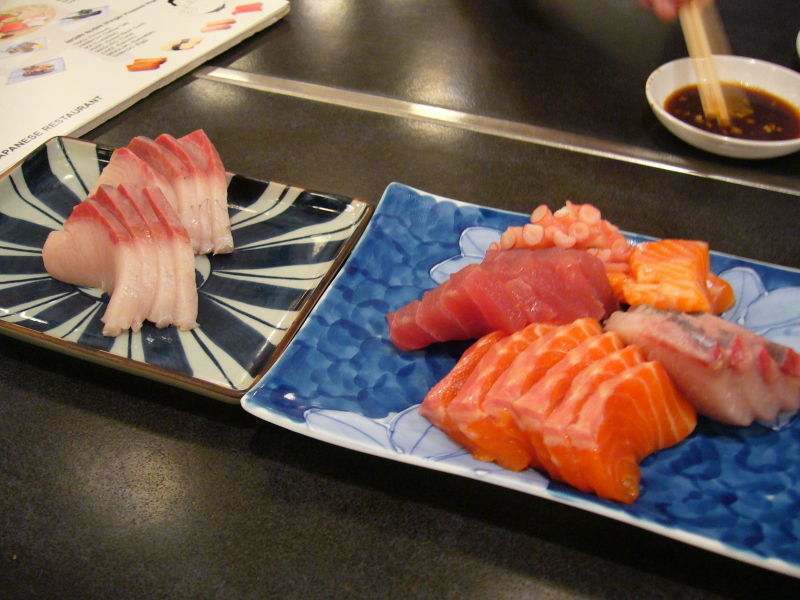 Sashimi is a word meaning sliced meat or fish. Sliced raw fish cut in the sashimi manner is often served in sushi restaurants, where diners may want just plain fish to eat with rice or condiments. Sashimi is not sushi, for it does not come bundled with vinegar rice as sushi does, but it is almost always available where sushi is. 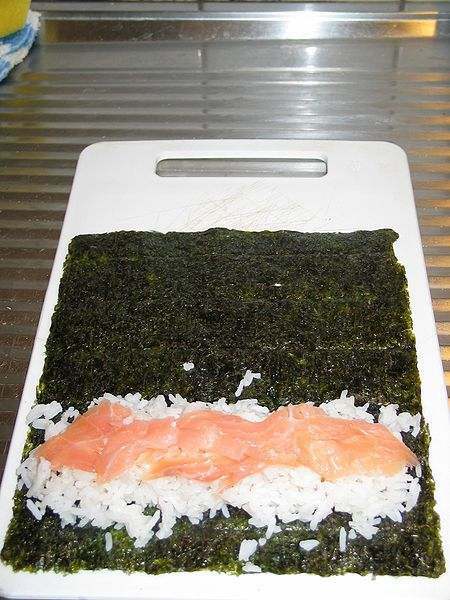 Don’t like raw fish? No worries: there are plenty of cooked ingredients on the menu as well. Shrimp, grilled eel, and egg custard are just a few of the common ones, and many rolls have all-vegetable or veggie-and-cooked-fish ingredients. Ask your waitperson for suggestions if you’re in doubt. For some good recommendations on sushi restaurants near you, check out Yelp, or Citysearch if you are in a larger urban area. Good article, until the end: mixing wasabi into your soy sauce is not considered polite. A small dab of wasabi directly onto your sushi, one piece at a time, is better manners. Sake is not drunk while eating sushi, as both are from rice. Sake if fine with sashimi, but it is considered “low class” in Japan to drink sake with sushi. You’re right about those practices in Japan. If someone is traveling in Japan, they might want to be aware of those niceties. But in American sushi restaurants, both practices are quite commonplace. After doing some research, it looks like Japanese themselves are unfamiliar with the “no sake with sushi” stricture, which I have seen stated by other Americans around the net (but not by Japanese). There’s an interesting discussion of this custom, or non-custom, here: http://chowhound.chow.com/topics/364317. If readers of this column are Japanese and have a take on sake + sushi as it is practiced (or not) in Japan, it would be interesting if you could share your thoughts on the matter. Thanks! I would go so far as to say that the common Japanese person wouldn’t know most of the, dare I say, ‘proper’ manners when it comes to dining. While this is particularly true for the more traditional things, such as the tea ceremony, I think it’s still true in the every day home. However, manners and etiquettes also differ from different regions and chefs will often have a different sense of manners compared to their customers. Unfortunately, I don’t have any quotable sources so you’ll have to decide on the credibility yourself. I believe that the no sake with sushi is an old Kyoto manner but I think it was adopted by Tokyo at some point too (and then largely forgotten). If you go north, you’ll find that people would say the exact opposite, or rather to the effect that “sake is to be drunk with every meal” – and from my experiences, it also includes breakfast but I’m not too familiar with their customs. However, as most people will be quick to point out, most Japanese will have beer with their sushi. I would argue that this is more a case of being able to consume a larger volume before getting drunk rather than any sort of etiquette. In this day and age, I do not think that people find it poor manners to drink sake with sushi. I think to understand the differences in etiquette between places you need to become familiar with the socio-cultural history of Japan. — Actually, while typing this, I just recalled one of the old manners that my grandparents still abide by: don’t consume any drinks while at a meal. 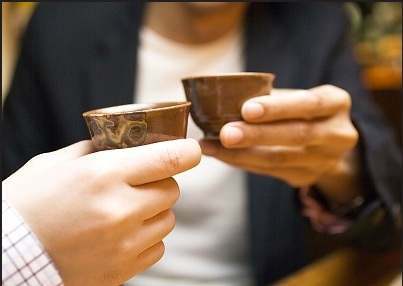 Be it water, tea or sake, they are to be consumed after the meal. I believe a lot of well to do families were particularly strict on this manner, especially from the Taisho era (possibly before, I do not know). It would be rare to see the current generations abiding by this manner though. As for soy sauce and wasabi, the general rule of thumb is that if the establishment has soy sauce and wasabi available for self service, it won’t be considered rude to mix them together. The establishments where it would be rude to do so won’t have the wasabi, if not both, available for you to do so anyway. The reason being is that the old establishments (some I go to are 14th generation? So about 300 years old) are very strict in the order and flavour that is to be consumed. While people are free to interpret this rule as they like, but it’s generally a case of the chef orchestrating the degustation experience. 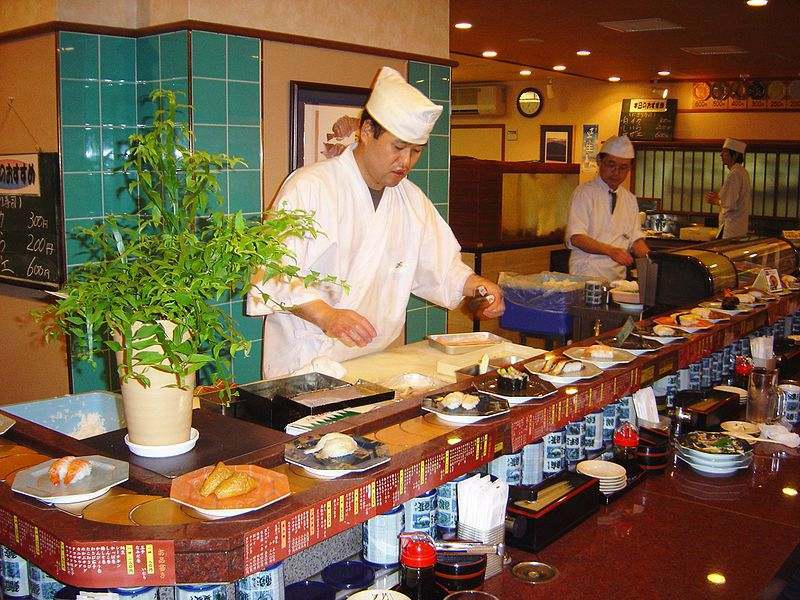 In these cases, the ‘correct’ amount of wasabi and soysauce is often applied to the sushi by the chef before serving. – The way in which sushi is counted is actually different depending on where you go. Edomae-zushi (the traditional sushi from Edo or Tokyo) had a lot of neta (the topping ingredient) in relation to the portion. You can still see this in the portions of “anago” (eel) however, each portion is counted as being 1 “kan”. However, in Kansai, the neta portions were considered somewhat unrefined (particularly by Kyoto) and so the neta was often split into two portions and was still counted as being 1 kan. A lot of old sushi places in Kansai still count as 2 portions of sushi as being 1. This is also why most places serve two portions of the smaller sized neta or one portion of the larger sized neta. – You can tell where a chef is from by the knives he uses and the way he fillets fish. The Kanto (Tokyo area) chefs use a flat ended Tako-hiki knife for preparing sashimi where as Kansai chefs use their Yanagiba (single bevel knife which ends in a point). Strictly speaking, the tako-hiki is a knife used for octopus so I do not know why they use it for sashimi in Tokyo (I am from Osaka, hence Kansai). The other tell-tale sign, filleting the fish, is that a chef from Kansai will fillet from the belly while a Kanto chef will fillet from the back. If you are taught in a reputable kitchen, you will be taught only one way and that will be the only correct way… and that will all depend on where you learn. The reason why is that in Edo, which had the greatest number of samurai living there, cutting from the belly was considered inappropriate by anyone other than the samurai class, hence why it is considered disrespectful and rude to fillet a fish from the stomach. Osaka, on the other hand, was a city of merchants. Here, it was considered ruder to cut something from its back and so they fillet from the belly. This is a fairly minor faux pas, and a manner that is largely ignored, if not forgotten, in homes. However, the manner in which you eat a whole fish is a different matter all together… but that’s not something that comes up for sushi! I think, ultimately, that comparing manners between a fast-food sushi joint and a reputable establishment is like the difference between manners employed at a McDonalds and a high class restaurant. The price tag is often a good indicator so just look around and see what other people are doing. Thanks for that detailed reply, V. Customs and their socio-cultural backgrounds are fascinating to me, and in this case filling in gaps for myself and other. I really appreciate that information. Thanks!